The biggest news is that yes, I'm going to be teaching a painting/art business workshop next November. I've made my own event page for it here many more details can be found here on the official site, and more details below. November 17-20th, 2016 in Nashville - Myself and a fantastic group of professional artists make up the faculty - It's a four-day workshop and symposium where students will create artwork, attend lectures and get specific advice on building their business. We'll be living, eating and working along side each other for the full four days on an idyllic campus in the hearth of Nashville. There is a limited number of spots - 45 students in all. It is expected to book up completely. 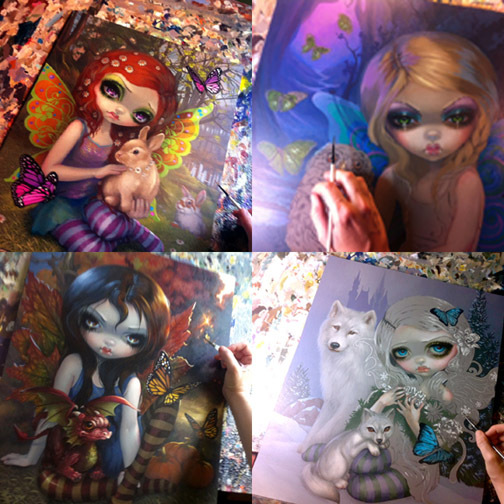 In other news - my solo show "The Four Seasons" is coming up on Saturday! The evening of December 12th at Pop Gallery here at Disney Springs (the new name for Downtown Disney) in Florida - details are here. Details and some sneak peeks are below. And yes, they will have my new coloring book there too! In fun news, I'm doing another figurine GIVEAWAY! This time for a the complete set of all of the "Three Fates" figurines, each autographed personally by me. The giveaway is through my Patreon here - with a member being randomly chosen at 8pm EST on Wednesday, December 9th. As long as you are signed up (subscriptions start at literally $1) you will automatically be entered. And finally just a head's up - several Limited Editions are almost SOLD OUT. "I Vampiri La Sorelle" here , -"Faces of Faery 226" (with the Wolf & Dreamcatcher)here , and "Beauty and the Beast" here are each sold out at Strangeling.com and there is literally one Limited Edition canvas of each left . Last chance to get one at the regular price, after these are gone there will just be the final #25 auction which usually goes for quite a bit more $$$. I'm teaching at an art/art business workshop next November! Myself and a fantastic group of professional artists make up the faculty - It's a four-day workshop and symposium where students will create artwork, attend lectures and get specific advice on building their business. We'll be living, eating and working along side each other for the full four days on an idyllic campus in the hearth of Nashville. So basically I can sit there with you and help you paint, teach ya to paint, you can watch me paint, we will have our meals and all that together, various professional artists will be on hand teaching classes and giving lectures, business stuff, painting stuff, you can bring lists of questions and we'll run through anything you need to know. There is a limited number of spots 45 students in all. It is expected to book up completely. November 17-20, 2016 In Nashville, TN. sam@samflegal.com with any specific questions. This year attendees will be staying on campus in the dorms at the Scarritt Bennett Center just steps away from our work and lecture area. Students will each have their own rooms and will share a bathroom with one other adjacent room. Meals are also served on site in a giant Hogwarts style hall. Must be seen to be believed. There are 45 tickets available for sale that will be sold on a first-come, first-serve basis. The signup page is here, definitely sign up sooner rather than later! I'm very pleased to announce my next giveaway up at Patreon! Not a member yet? Sign up here (click the "Become a Patron" button). 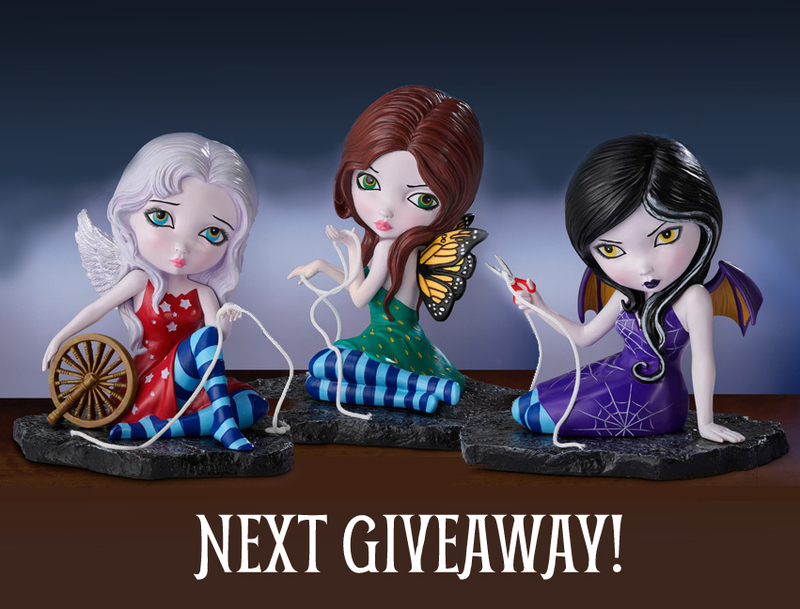 At 8pm EST on December 9th I'll be giving away the complete set (all three) of "The Three Fates" figurines! Each one is autographed by me right on the bottom/base, and yes, the winner gets all three. All you need to do is to be a member of my Patreon (even just the $1 level is fine) as of December 9th, and you will automatically be entered. Winner will be chosen by random number generator, and I'm happy to ship anywhere in the world. Patreon is not free, but the basic subscription is literally one dollar. Additional subscriptions get you more cool stuff too, but with the basic level you get included in all the giveaways (about every week or two) - including original paintings. If you don't want to wait for the giveaway or just want to buy them straight out, you can buy them worldwide at Burning Desires here. I will announce the winner on December 9th and will contact you via email & through Patreon's messaging system. Each of the four paintings for this event will be representative of one of the four seasons. Designed in harmony either as a set of four or hung individually, each will feature a fairy iconic of her season, with various animal friends. Backgrounds are inspired by 19th Century Romantic landscapes. Bright butterflies will tie the four together as well. Each of the Four Seasons original paintings is a 16"x20" acrylic painting on panel, will come in an ornate frame (the four pieces will be in matching frames), and will be priced at $6400. If you are interested in the original paintings, or in one of the Limited Edition Canvases (those will be exclusive to Pop Gallery as well, 16x20" in size too, priced at $595) - please contact Pop Gallery - popgallery@me.com or call them at 407-827-8200 and let them know. They will be taking down collectors' names for the VIP contact list. Details about the December 12th event (at Downtown Disney/Disney Springs here in Florida, from 6-9pm) are here - we'll also be debuting the new Coloring Book there too, don't miss it!